Arak is a fictional comic book character published by DC Comics. He first appeared in a special insert in Warlord #48 (August 1981) and was created by Roy Thomas and Ernie Colón. 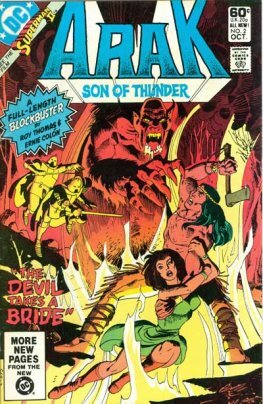 Arak (Bright-Sky-After-Storm) is depicted very much as a Conan knock-off in early appearances. Later, after encountering the Moirai, who explain his destiny to him, he takes on a more Native American appearance, including leather-fringed pants and a Mohawk hairstyle. 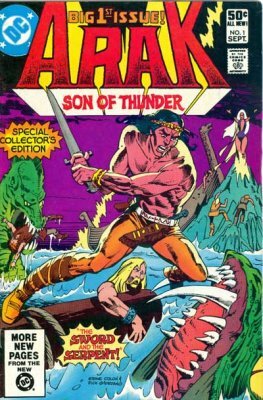 Unlike Conan (a character Roy Thomas also wrote during his tenure at Marvel Comics), who usually fought against H. P. Lovecraftian monsters and entities, Arak encounters figures and creatures from myth and legends, including Greek, Norse, Judeo-Christian, Muslim, Oriental, and others. Arak was relatively culturally sensitive for the time when it debuted. Unlike other Native American heroes, like Apache Chief, who took a cartoonish view of Native Americans similar to the old western movie Indians, Arak did not have broken speech or other stereotypical "Indian" traits. Also, the Vikings looked more like real Vikings and were not illustrated wearing the stereotypical horned helmets and fur clothing.